Now that it has reopened, let me make some great Adelphi hotel wedding photos from the early part of your wedding day as you get ready. As a Saratoga wedding photographer who values spontaneity and has a strong eye for detail, you’ll get some great detail photos from me. They won’t just be a ton of snapshots of every single possession. Instead, I’ll find the images that are symbolic for you. The ones that hold special meaning to you. 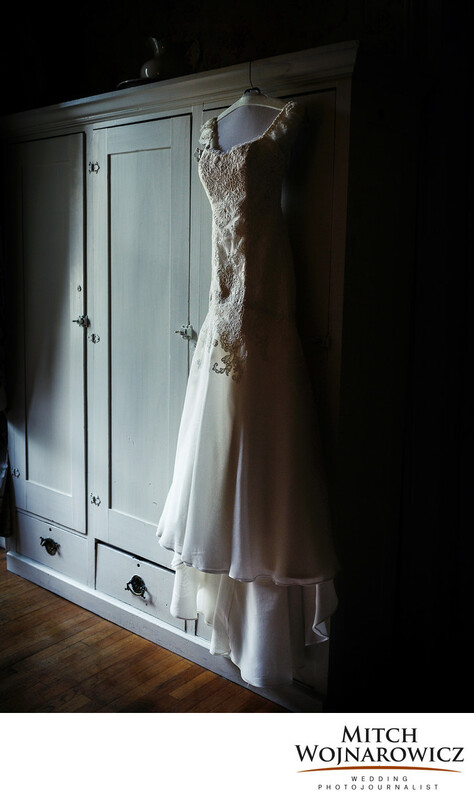 Your dress hangs at the ready in a downtown Saratoga hotel. It holds great symbolism for the day and is always one of a kind. This is something unique, in the strongest sense of the word, in your life. It deserves a great photo. As most milestone moments do. Do you need endless detail photos? A wedding is about people, fun, life affirming moments. Emotion. Not just possessions or the things you command. Years from now will you cherish a picture of your shoes? Wedding detail photos need to be about the moment in your life and not just a record shot of a thing. Your wedding photos shouldn’t look like an advertisement for the place where you celebrated. Your wedding photos should look like you. Want More Info About What I Do as a Saratoga Wedding Photographer? Keywords: adelphi hotel (3), saratoga springs (66).